Cloud-Based EHR Systems vs. On-Premise Software - Which is Better? As a practitioner looking to purchase a EHR system, you may be feeling overwhelmed. Do you need medical practice management software or an EHR? What’s the difference between an electronic medical record and electronic health record? What are deployment options? Which is right for me? 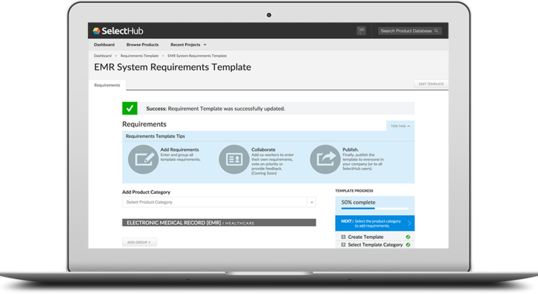 Don’t worry, there are plenty of resources out there to help you (like Selecthub’s EHR comparison report). This article will provide a quick rundown of what deployment means and why it matters in your field. Deployment environment is basically a habitat for software to live in. It is a collection of clusters, servers and middleware that work together to host that software. These environments can be simple, where a program is developed and executed on the same machine — but they can also be as intricate as a biological ecosystem where software is hosted over a range of steps and locations. The method of deployment you choose matters almost as much as the choice of which software you use. Every method for deploying software comes with unique benefits and drawbacks. Pricing, accessibility, convenience and security are some of the main features to look at when choosing between EHR systems. So let’s break them down. While there are other deployment options (like hybrid or hosted) the two most popular deployment environments are on-premise and cloud. On-premise deployment involves hosting the EMR or EHR software on in-house servers that are maintained and implemented by an organization’s IT team. Cloud-based is an online Software-as-a-Service (SaaS) implementation that hosts the software in the cloud where users access it via the internet. Both come with unique pros and cons that can impact your decision-making, and we’ve done some research on those so you don’t have to. We get it — storing sensitive patient data in the cloud can be nerve-wracking. What if the internet goes down and you can’t access your data? What if it gets lost? What if it gets hacked? These are the concerns of users who swear by on-premise solutions. Because your data isn’t traveling anywhere, it is typically safer and more secure from hacking. Keeping your patients’ electronic medical record data safe from prying eyes is a high priority, so security features should be at the top of your list when considering software solutions. On-premise deployments can be convenient for some specific needs. It allows users to work without an internet connection. If the Internet goes down, that doesn’t mean you have to. This option is very customizable during implementation. Since users are basically building the hosting environment from scratch, they can request the vendor to customize various aspects to their specifications. And if you need support with on-premise, you’ll most likely already have a robust IT team supporting your practice and won’t have to wait for customer support to react to your needs. Since on-premise software is deployed via your internal servers, you’ll never have to worry about slow connectivity because of slow internet. If your internal server connection is strong, your software will run at its best. Being in control of your own security is both a pro and a con. While you may be less likely to be hacked, you are also responsible for managing your own security measures. Your practice’s IT department will be busy when you choose on-premise — they will have to manage everything from implementation to support to repairs. On-premise software can be pricey: from maintaining that IT department to the original installation and upfront software license fee, on-premise will usually be more expensive than cloud-based deployment. This may not be a problem for a multi-physician practice or hospital, but a small practice may find it cost-prohibitive. Software updates that aren’t included in your original contract may cost extra as well and need to be implemented by the users rather than the vendor. While large hospitals could definitely benefit from on-premise EHR software, family practices may find it difficult to come up with the space for servers as well as the money for the initial implementation. With backup services so prevalent and affordable these days, it’s unlikely that your data would be stored only in your on-premise server. But in the event of an incident like a fire or flood, on-premise software has the disadvantage of being stored in a physical location. Cloud EHR systems are becoming ubiquitously more popular — regardless of the software field, and it’s not hard to see why. Web-based EHRs don’t require complex installation processes where technicians come to your practice and set up intense infrastructure to host your data. It can all be done via the internet, with no need for a large IT presence to support you if you have trouble. Speaking of all being done on the net, cloud-based EHR solutionsgives you any time, anywhere access. Need to take your EHR on a tablet to patients’ rooms? Cloud has you covered. Want to access patient notes via a smartphone? Cloud can do that too. Although there is a general consensus that cloud-based data storage is less secure than on-premise, it’s not as significant a liability as some sources make it out to be. Because the vendor is responsible for security measures you know they’ll utilize robust security services to keep sensitive patient data safe that you potentially couldn’t afford on your own. As cloud becomes more popular, the security discrepancy is also shrinking. Plus, because your information isn’t stored physically within your premises, it is protected in the event of a natural disaster or other unforeseen incident that could destroy an on-premise system that isn’t backed up. Cloud-based EHR systems will also typically be more cost effective. Cost is determined mostly by number of users and usage of features, and many EHR systems will only charge you for the features you want access to. Most vendors offer extensive customization abilities. If your practice operates across multiple locations, cloud allows you to all collaborate within the same system regardless of distance. Just because on-premise is often more expensive than cloud, it doesn’t apply to every situation. Costs can accumulate quickly when utilizing cloud-based software. A monthly subscription fee could end up costing you more in the long-term than a one-time licensing fee depending on how long you end up using the software. Because patient data is transferred back and forth across internet connections, it is vulnerable to attack at more points than data secured onsite. Maintaining HIPAA compliance is crucial for a practice to continue delivering patient care, so make sure to do research into whether a vendor is reputable. Because you are purchasing a software platform that another organization controls, there will also be less extensive customization features than an on-premise software you implement to your specifications. Deploying your online EHR in the cloud can also establish a relationship of dependence between you and the vendor. You rely on them for updates, support and access, which may be something you don’t want to risk depending on the reliability of the vendor. That’s one reason it’s important to do your research beforehand! Keep in mind that cloud based EHR systems are, well, cloud-based. That means if your facility is having connectivity problems, you could be without your EHR. Cloud-based software will also go through automatic updates, which can sometimes happen at inopportune times and interrupt your business. These problems aren’t limited to unexpected internet outages. If your practice has limited bandwidth or a generally underperforming internet connection, you could experience serious problems with a cloud-based EHR system that can’t be fixed by customer support. We can’t make the choice for you, but hopefully we gave you the knowledge you need to make an informed decision. On-premise EHR is a valid option for security-conscious, technology-savvy practices. Cloud-based EHR is an equally valid solution for those who want the convenience and accessibility that comes with the age of the internet. Check out our EHR comparison report to compare some of the most popular EHR solutions for both deployments. Which deployment do you use? An on-premise or a cloud based EHR system? What made you make that choice? Have you had good or bad experiences of your own with EHR deployment? Leave us a comment, tell us about it, and help others determine which deployment is best for them!